The cello part for Dvořák's Symphony No. 8 in G major, Op. 88 has been edited by Frank Miller and Stephen Balderston. Miller was formerly the principal cellist of the Chicago Symphony Orchestra for over 20 years, and Balderston is a former Assistant Principal Cello from the Chicago Symphony Orchestra and current String Coordinator and Professor of Cello at DePaul School of Music and. Miller's bowings and Balderston's fingerings have been added throughout the score along with other editorial markings . Dvořák's eighth symphony was composed in 1889 on the occasion of his election to the Bohemian Academy of Science, Literature and Arts. It premiered the following year in Prague. The first movement is a powerful and glowing exposition, opening with a lyrical G minor theme. The second movement is an Adagio at brisk pace, followed by a melancholy third movement waltz in 3/8 time. In the finale, a turbulent "complex theme-and-variations," Dvořák draws on predecessors such as Beethoven and Brahms while also infusing a jovial and optimistic character that is unmistakably Czech. Download and print the score today to gain access to expertly edited Dvořák Symphony No. 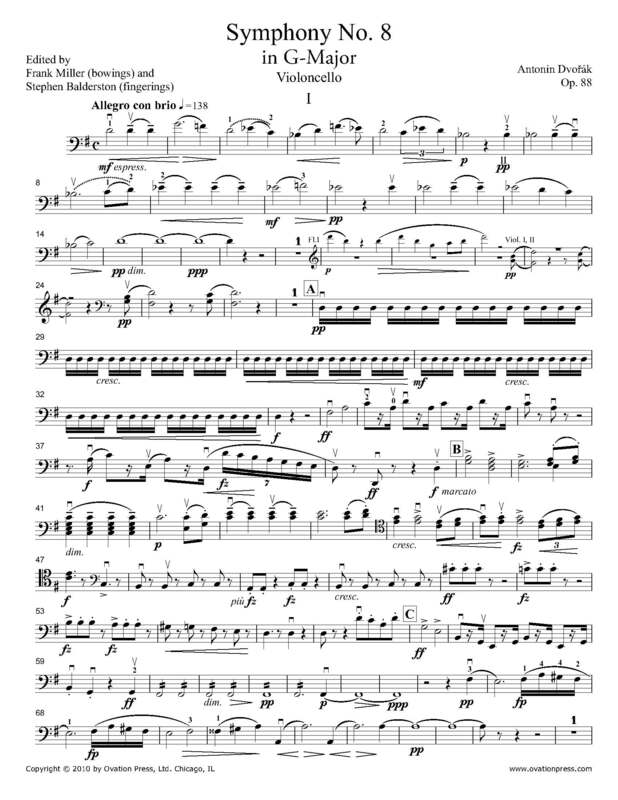 8 cello fingerings from Stephen Balderston and bowings from Frank Miller!